This was a rapidly painted demonstration in which I attempted to simplify the subject and work in a loose, fluid style. I was helped in this latter aim by using large brushes and rags to apply the paint. Possibly the most important means of achieving looseness in this and other paintings is to limit the time you spend painting. This painting was completed in less than 30 minutes. To be honest, this could be almost anywhere in Europe. It is, in fact, an imaginary image but no less real for that. I lived, until recently, by a forest in Devon where landscapes such as this were around every corner. It was painted as a demonstration lasting about 40 minutes. This is from a sketchbook painting made in early summer (2014) and subsequently painted in my studio in England this year. This river runs past (and through) the Watermill and is always fascinating - being at different states, sometimes on a day to day basis. There’s some ‘artistic license’ at work here as I’ve imagined an autumnal scene. I'm often asked to help with painting moving water. 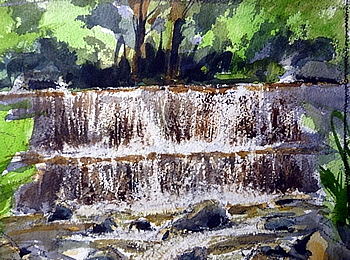 In my early years we've painted the river directly behind the mill, but then I discovered a waterfall just upriver. 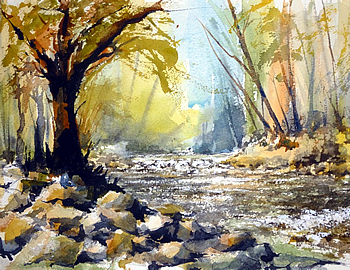 This is a watercolour I produced from a dry vantage point in the river. My students then went on to make their own paintings, either of the waterfall or of another part of the river. Mike Willdridge is very experienced in a variety of painting and drawing media – as well as printmaking – and regularly teaches from his studio in Devon and on painting holidays abroad. In his own work Mike is continually trying to move towards 'abstraction' and usually works in a quick, loose style. He is an energetic and enthusiastic teacher who often encourages his students to be bold/take chances. He is particularly keen on all forms of drawing and constantly uses a sketchbook. During his course, Mike will teach students how to gather speedy impressions using a sketchbook, to be worked up afterwards in the studio. 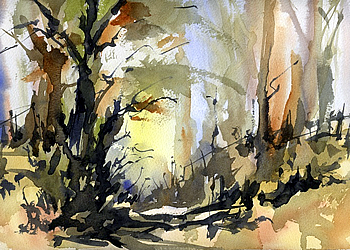 Mike will concentrate on teaching watercolour painting, but is also happy to help with gouache and acrylics. He will also help people to improve their drawing and to learn how best to keep a sketchbook while on location. Mike first qualified and worked as a Graphic Designer before joining the Army and serving in many countries. But more than 20 years ago he left the army to become an Art Teacher and was the Head of Art at two independent schools before taking early retirement to teach adults and paint in Devon. 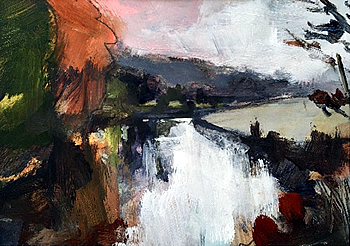 Since then he has exhibited regularly at the Mall Gallery and Llewellyn Alexander Gallery, London and at several galleries in Devon. "If anyone is choosing such a holiday, I can tell them that this was perfect. Excellent accommodation, the food was superb (any special diets catered for), delightful company and the tutor was excellent, just the right balance between holiday and learning. The holiday was very well organised. Everything had been thought of including providing water to take out on our trips. Chairs, easels, boards and water bottles were all provided. It was inspirational. Before this trip I had not produced any outdoor paintings of any sort of quality, but I now feel confident enough to try going out anywhere and painting." "Many thanks for a wonderful week at the mill. The food, tutoring and company were really wonderful."